So you put away your stinky coat and your perfectly stickered board because the snow season is over, right? Wrong! Echo doesnt want you shopping for bathing suits just yet! Even though most all the other mountains are closing, Echo Mountain Park is still standing... 10,700 feet tall. 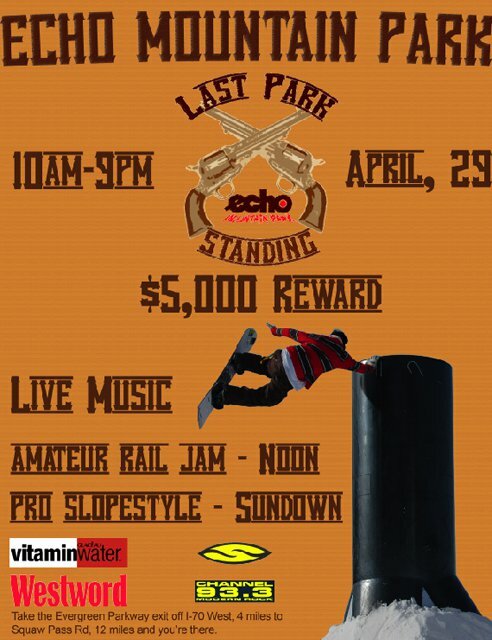 On April 29th, as a way of saying thanks for you support in our grand opening season, were throwing our biggest party of the year - &quot;Last Park Standing&quot; - and you and your friends are invited to shred for only $20 bucks all day. Bring your six shooter because at noon were hosting an amateur rail competition. Registration starts at 10am to the first 50 who sign up ($10 reg fee, over $1K in prizes = good odds). Plus weve got a pro competition at 5pm, live music, games, and oodles of shwag from our sponsors all day. Total cash and prize pool for the 29th is $5,000. Thanks to our friends at Sobe, Smith Optics, Glaceau Vitamin Water, Never Summer, Channel 93.3, and Westword Newspaper.